Acrylix is a new breakthrough brush designed as a synthetic alternative to the hog hair brushes for acrylic and oil painting. It goes way beyond to offer exciting new properties of its own. Acrylix, though firm, is flexible and has a lovely silky working texture - something it retains after many sessions in use. Prolonged standing in water has virtually no effect on them which is essential when using fast drying acrylic colours. This durable pearly filament also helps the artist to see and judge the colour on the brush; they'll endure and delight! This excellent value set consists of a selection of 10 Acrylix brushes, all contained within a Pro Arte brush case. The total value of the contents of this set is over £82! 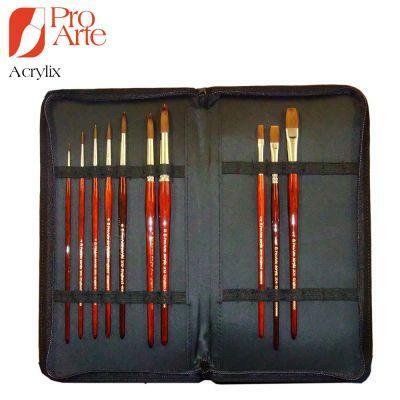 I phoned for advice about a good quality brush set for my sister who has started painting with acrylics and I was recommended this set among others. I purchased the set and had it delivered to my sister. My sister's reaction when she received this set was priceless! She was delighted and told me off for buying her such an extravagant set! Fortunately for me she had not seen how much I actually paid for it and was going by the prices of individual brushes in her local art shop.